Keyfax employs a highly skilled staff at its 7000sq ft offices and studios in Santa Cruz California, and also works with a number of specialist programmers and developers around the world. In addition to a custom sound stage and multi-station video edit suites, a fully-equipped audio recording studio was completed in 2008. Whether it is in product design, pricing, delivery, or support, Keyfax understands the needs of modern electronics-oriented consumers; in particular, those with a specific musical inclination or dimension. To better reflect its diverse skills and operations Keyfax Software incorporated as KEYFAX NewMedia in April of 2005. KEYFAX NewMedia was founded in the UK in 1994, as Keyfax Software, to produce and market the company's original concept of 'MIDI Samples,' released under the brand name "Twiddly.Bits." Founder Julian Colbeck, who had pursued twin careers of professional keyboard player and music technology pundit writing for most of the world's music technology magazines, felt that most 'MIDI music' sounded terrible. But maybe the culprit wasn't MIDI in itself so much as the way MIDI data was being generated. When Colbeck was asked to review a particularly dismal collection of Standard MIDI File song collections for the British music newspaper Sounds, frustration led to developing the concept of a MIDI Sample: the recording of MIDI performance data that was generated by a real musician playing a real (technically a 'MIDI') guitar, drumkit, or wind instrument. With leading British programmer Dave Spiers in tow, Keyfax then began work on producing a series of MIDI Sample loop libraries, starting with Twiddly.Bits General Instruments, released in 1994. Within a few months Twiddly.Bits grabbed the attention of the world's music press and sequencing cognoscenti alike and over the next few years many more Twiddly.Bits libraries were produced to growing critical and public acclaim. New libraries continue to be produced to this day; the 25th collection, Colombian Rhythms, was released in May 2008. In 1998 KEYFAX released another original concept - the world's first MIDI Performance Controller - Phat.Boy, to much critical acclaim and substantial retail sales. Over the next two years Phat.Boy established and then defined the market for MIDI controllers, becoming a household word in the then burgeoning laptop DJ / producer / remix scene. In 2000 Keyfax launched the first in a series of native content libraries for the Yamaha RM1x; an association that led to preliminary work (including content licensing) on the forthcoming Motif range of synthesizer workstations. 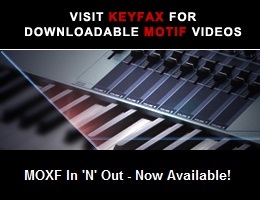 The Motif series was launched in Summer 2001 and Keyfax designed and produced a dedicated website, Motifator.com, to introduce the technology and associated products and possibilities to the general public. Motifator.com quickly established itself not only as a powerful entity for the Yamaha Motif, but also became a blueprint for other instrument and technology sites providing clear and concise product support on a human scale and with a human, 'community' dimension. In 2003 Yamaha Corporation of Japan appointed another Keyfax site, mLANcentral, as the centralized global resource for the disbursement of mLAN information, and subsequently several other product sites have been produced including SNninety.com (for Yamaha S90) AWinspire.com (for AW series of Digital Audio Recorders), 01xRay.com (for 01x mLAN Mixing Studio), DTXPERIENCE.com (DTX Series Digital Drum Kits), and ArrangerWorkstation.com (Tyros and PSR ranges). In 2004 Keyfax produced its first artist website, AlanParsonsMusic.com, for the legendary artist and producer Alan Parsons. In addition to being the official site for information, the site also handles sales of AP back catalog and merchandise. In 2005 Keyfax launched SteinbergUsers.com for users of one of the world leaders in music software, Steinberg Media Technologies GmbH. Concurrently, Keyfax created a serial-number-based system for automated sales of product upgrades, and its distribution arm was appointed as the official and exclusive purchase point for all Steinberg products in the USA. In recent years Keyfax has produced custom web solutions for markets as varied as cosmetics and wine-makers, but still focuses on consumer electronics, with music as a high level skill. Clients include leading Chinese manufacturer CME, industry organization The MMA (MIDI Manufacturers Association), and most recently an exclusive sales and marketing site for the revolutionary new digital instrument Tenori-on. Julian Colbeck had written and presented several popular videos back in the early 1990s, including Analogue Heaven, and the entire " Getting The Most Out Of " series. Keyfax then revisited the video medium in 2001 with Get Motifated, a complete 2-hour introduction to the Yamaha Motif presented on video and DVD. Get Motifated became one of the best selling instructional DVDs of all time, also winning a coveted Videographers Award. In 2002/3 Keyfax went on to produce two further advanced user DVD guides to Motif, and a 3-hour DVD for the Motif ES. In 2004 Keyfax produced The 01Xperience, a full length, 5-language DVD for the Yamaha 01x, and, at the end of the year, Exploring Sound Reinforcement, a 2-hour, six language magnus opus on PA's and accompanying products that is currently featured on the home page of Yamaha.com. In 2005 Keyfax edited and produced the concert DVD Alan Parsons Live In Madrid , a master class on the Yamaha S90 (S90 Under Control), and more than 50 web videos, ranging from instructional feature-guides to artist interviews. A major (9-hour) work on sound design, Sound Advice, was released in 2006, and in 2007 a further four programs were released on specialty instruments and software: Go MO, Using Cubase 4 The Recording The Band, Motif XS MasterClass, and Making Beats On The Yamaha MM6, which has gone on to receive top honors at the 2008 Aurora Awards in the Art / Culture Instruction category. In 2008 KEYFAX is partnering with legendary record producer and artist Alan Parsons on a TV/DVD project entitled Alan Parsons' Art & Science Of Sound Recording, due for release in 2009.